A bug out bag is a cache of emergency food, water, gear, clothing and supplies stowed in a pack that may be – but doesn’t have to be – designed specifically for the purpose. Following the bug out bag list below and making sure you have everything on it will go a long way toward assuring that you can survive – even thrive – for 72 hours in a natural or man-made disaster. Think tornado, hurricane, flood, forest fire, earthquake, tsunami, or even a terrorist attack like 911, that could disrupt the routine of daily life for an extended period of time. Why 72 hours? Bug out bags can be assembled for shorter or longer periods of time, but 72 hours has become the accepted timeframe because that’s how long humans can survive without water. You may have heard people refer to a bug out bag by other names: 72 -Hour Kit, Grab Bag, Battle Box, Personal Emergency Relocation Kit (PERK), Go Bag, GOOD Bag (Get Out Of Dodge), or INCH Bag (I’m Never Coming Home). While there may be some differences from one type of kit to another, they all have the same basic purpose – survival in an emergency. There are many variations on the BOB theme: bug out bags for families, for parents with infants, for the elderly, for people with special medical conditions, for pets. But what you are going to find in the checklist below is the “classic” bug out bag, that is, for one adult person in reasonably good health. After you get familiar with what’s on this list, you can make adjustments based on your individual circumstances. In the comprehensive bug out bag checklist below you’ll see plenty of specific brand names. If you clicked on the links and bought those items immediately, you couldn’t go wrong. They are top-rated gear and recommended by more than one survivalist or experienced outdoors person. But the real reason for including them in this checklist is so that you can see specific, concrete examples of the types of gear on the list. The purpose here is not to connect you with one brand or another but to be sure you are familiar with the specific types of gear that are essential to your bug out bag. Bug out bags differ from hiking backpacks in several key ways. The most important two being that they are larger and heavier and are designed with multiple pockets and compartments for organizing the contents. Here’s a table with 5 top-rated bug out bags. It shows a comparison among them with regard to 3 of the most important BOB characteristics: size, capacity and MOLLE Compatibility. Capacity. Look for something over 2,500 cubic inches or 40 liters and less than 6,000 cubic inches or 98 liters. Molle (pronounced MOLLY) Compatibility. MOLLE is an acronym for Modular Lightweight Load-carrying Equipment. It means that compatible pouches and accessories such as hydration bladders can be attached to the bag. Generally speaking, the more compartments the better. They make it easier to organize the bag’s contents. Look for a bag made from thick, heavy fabric like 1000d Cordura Nylon, and with heavy-duty YKK-quality zippers. In a BOB, durability takes precedence over weight. *This is the pack’s basic capacity. Some bags are expandable. Here’s a detailed bug out bag packing list of the gear, clothing, food, and supplies that go into your pack. Water Containers: Stock your bag with three liters of water in three different containers: one stainless steel, one plastic, and one collapsible. Plastic Container For the plastic container, both the Nalgene Tritan Wide Mouth BPA-Free 1-quart water bottle and the CamelBak Eddy .75 Liter bottles rank among Amazon’s best sellers. Either would be good choice. Collapsible Container A collapsible water container gives you one more welcome option for transporting water and only takes up a little more space than the water in it. For example, an empty Platypus Collapsible Water Bottle weighs 80% less and takes up one fifth as much space as a hard bottle of the same volume. It’s also 100% BPA free. Water Filters: Supplement your water bottles with a water filter. The Sawyer Mini Water Filtration System weighs just 2 ounces and fits in the palm of your hand. It filters up to 100,000 gallons of water. The popular Lifestraw Water Filter can filter about 264 gallons. Another good choice is the Katadyn Vario Water Filter that filters up to 500 gallons per cartridge at the rate of up to two liters per minute. All three of these options are generally equivalent in terms of the quality of filtration. Water Purification Back up your water containers and filtration system with water purification tablets. Potable Aqua Water Tablets use iodine to make contaminated water acceptable for drinking although the iodine affects the taste. AquaMira Water Treatment Drops uses Chlorine Dioxide to kill bacterial making water safe to drink. Freeze Dried Food: There’s a simple solution to one of the major components of your bug out bag. Mountain House offers a Just in Case 72 Hour Kit that includes a complete 3-day supply of food for one person. In the assortment are granola with milk and blueberries, scrambled eggs with bacon, beef stroganoff, chicken teriyaki with rice, rice and chicken and pasta primavera. All you do is add water. Shelf life is 12 + years from the manufacturing date listed on the back of each pouch. Protein Bars: Add a few Pure Protein Bars for snacking and you’re all set in the food department. Fishing Kit: The Best Glide Emergency Survival Fishing Kit comes in a small metal can that fits easily into any BOB. It was put together through a collaboration between fishermen and survivalists and contains enough fishing gear to get the job done in emergency situations, including jigs, hooks, leaders, split shot, bobber, line and bait. Pot: The MSR Alpine Stowaway Pot is a rugged, versatile stainless steel pot with a lid and a hinged handle that flips over to lock the lid in place. It comes in four sizes: 9.5 oz., 13 oz., 15.5 oz. and 19.5 oz. The inside of the pot is valuable storage space when you’re not cooking. Cup: The GSI Outdoors Glacier Stainless Cup is designed with multi uses and space saving in mind. It fits over a standard 1 liter water bottle; a fuel canister will fit inside. The bail handle folds out of the way. Utensils: GSI Outdoors Glacier Stainless 3 Pieces Ring Cutlery. The knife, fork and spoon are ringed together so there’s no chance of losing one. Stainless steel – rust proof and weatherproof – is the ideal material for any situation that a BOB might be utilized for. Stove: The Emberlit Stainless Steel Collapsible Stove weighs 11.3 oz. It folds flat to fit just about anywhere in a bug out bag. It burns almost anything and generates heat efficiently. It can boil water in just a few minutes. Grill: Include a small grill to fit on top of the Emberlit stove. Clothing is seasonal and location-specific. You should have at least two complete sets of BOB clothing depending on your location. Wet clothing is not only uncomfortable, it’s dangerous. Check out the video below for some tips. Hypothermia is a serious concern and the possibility of it occurring, even in summer, is much greater if your cloths are wet. Boots or shoes suitable for walking or hiking. Here’s a list of the best hiking boots and shoes of 2018 as rated by Consumer Research. Any of these, or similar footwear that you may have on hand, would be a good choice for your BOB. A pair of versatile long pants with zippered pockets like the Singbring Waterproof Hiking Pants. These are among Amazon’s bestselling hiking pants for men and women. Or the Geval Windproof Quick Drying outdoor Pants (for men). You’ll get more mileage from a poncho than a rain suit. It can serve as a tarp and pack cover as well as rain protection. A bandana. This simple 22” x 22” (standard size) piece of cloth has a multitude of uses in a survival situation including: potholder, tourniquet, napkin, neck gaiter and more. One creative survivalist came up with a list of 30 ways he could imagine putting a bandana to use. Tarp: Can be used for shelter, ground protection, or water collection. 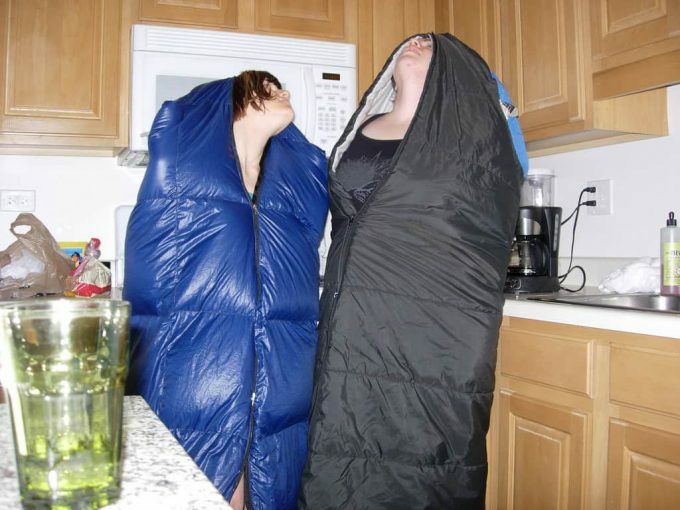 Emergency Blanket: Adventure Medical Heatsheets 2-person Survival Blanket is a good choice. The choice of a sleeping bag for your bug out Bag includes selecting between mummy or rectangular shape, and down or synthetic fill. But the most important choice is the temperature rating. You can have a summer and winter bag and rotate every four-to-six months, along with updating your seasonal clothing. But if you only have one sleeping bag, think about the lowest temperatures in which the bag will be put to use and select the bag accordingly. You will find lots of uses for a wool blanket and be glad you included one in your BOB. A wool blanket can keep you warm even when it’s wet. With the sides duct taped together it can be converted to an emergency sleeping bag. When worn like a cloak or shawl, it can provide warmth and some protection from rain. Folded and tied with paracord, it can serve as a supplementary backpack. A sleeping pad ads comfort and helps ensure that you will get the rest you need. Here are 5 top-rated sleeping pads. Waterproof Matches: UCO Titan Stormproof Matches keep their flame in high winds and heavy rain. Fire Starting Tool: in addition to waterproof matches, you need a dependable, easy-to-use fire starting tool. Lighter: A Bic lighter can be your go-to fire starter and, with luck, may be all you will need. Fire Starter: Lighting Nuggets fire starting nuggets makes it easy to start fires inside and out. They are top-rated by Amazon customers and come in a box of 100. First Aid Kit: The Adventure Medical Kits Mountain Series Fundamentals would be a good choice. It’s rated as a top first aid kit by outdoor Gear Lab. It contains bandage materials, bleeding control, blister/burn treatment, basic instruments, wound care and other first aid treatment as well as a copy of The Complete guide to Wilderness and Travel Medicine. Medical records if necessary. Allergies, for example. Dust masks. Remember the images on television of smoke and dust storms that occurred in the wake of the collapse of the Twin Towers on 9ll. Multi-tool: such as a Leatherman or Swiss Army Knife. Paracord (parachute cord, or 550 cord) is a strong, lightweight, somewhat flexible nylon rope originally used as the suspension lines of parachutes. It can have multiple uses in an emergency situation. Pack about 25 feet. Duct Tape: Duct tape has 1000 uses around the home and 1001 in an emergency situation, everything from patching a tent to making vehicle repairs. Wire: Pack a small roll of 22-to-26-gage wire. Just as with duct tape, there are multiple uses for a roll of 24 gage wire, including emergency auto repair and creating various types of hangers for cooking pots or clothes. Fixed Blade Knife: A quality fixed blade knife has a multitude of potential use in a bug out bag. Some survivalists consider it the most important item in the bag besides water and food. A good choice is the Ka-Bar Becker 22 that comes with a MOLLE compatible sheath with a cargo pocket for storing a sharpener or fire starter. Folding Bucket: A folding bucket such as the Free Grace Collapsible Bucket has multiple uses besides carrying water, including washing hands, dishes and laundry. Axe or Hatchet: Estwing E24A 14-inch Sportsman’s Ax with Leather Grip & Nylon Sheath is a good choice. Head Lamp: A head lamp is essential for being able to work with both hands in an emergency situation. The Coast HL7R is a good choice of headlamps. It was rated a “Best in Class” by Gear Institute. Hand Crank Flashlight: The ThorFire & More LED Flashlight is solar powered and hand crankable. No battery needed. After one minute of hand cranking it produces 80 minutes of light with one LED and 60 minutes of Light with all 3 LEDs. Hand Crank Radio: The Kaito Voyager is a good radio in emergency situations. Cranking at 120 turns per minute will generate strong current and voltage. Under direct sunlight the solar panel alone will power the radio. A USB jack connects to charge an iPod or cell phone. It has a white LED flashlight with a red LED blinking light for emergency alert. Emergency Whistle: An emergency whistle like the Karma Gear whistle can produce 100 decibels that can be heard a half-mile away. Signal Mirror: The credit card-sized Adventurer Series Military Grade Signal Mirror is military approved and military issued. Light Sticks: Glow Mind light sticks produce an attention-getting light for 12 hours. They retain power for 3 to 4 years but the quality of light starts to diminish before that. How much money should you have available for the kind of emergency situation that would cause you to use your bug out bag? One survival expert, who has a successful series of YouTube videos on the topic, says he keeps $2,000 in his safe for emergency situations. Human nature being what it is, essentials like water, food, and gas are going to cost more during the kinds of emergencies that would require a BOB. Maps and Charts. Accumulate maps and charts of areas that you are likely to evacuate to. Topo maps and county highway maps provide information about backroads and present it in a readable format that is available nowhere else. Pack a highway map of your state. Read our piece on how to read maps to increase your chances of survival. GSP with a GPS unit like the Garmin eTrex in your bag you can travel directly to locations you select even though travel condition may be difficult. Compass: The SE CC4580 MilitaryLensatic/Prismatic Sighting Compass is one of the bestselling compasses on Amazon. Firearms and Ammunition: A .22 caliber rifle like the Ruger 10/22 can be used for hunting small game as well as personal protection should the need arise. If you feel the need to add a handgun, choose a 9mm or 38.special. Pack 30-40 rounds of ammo for the handgun. A box of 600 rounds of .22 ammo takes up about the same space as a box of shotgun shells that’s enough to hunt with. Knife: see knife in Tools, above. Pack personal identification in a waterproof pouch and keep it in a easily accessible location in your BOB. One more tip that’s not about adding gear but about adding PREPARATION. Have a Plan in place for any kind of emergency or natural disaster. Be familiar with evacuation routes. Coordinate with family and friends about meeting places and how you’re going to communicate. And finally, think about your bug out bag as an opportunity to expand your knowledge of the outdoors and survival techniques. You should inspect and rotate the gear in your BOB every four-to-six months. This is particularly true with regard to seasonal clothing and your sleeping bag if you live in a location with wide variations in temperature. Use these regular checkups as a time to learn more about your gear and become more expert with it. Start a fire with your Exotac NanoStriker XL Firestarter. Cook a Mountain House chicken teriyaki meal on your Emberlit stove. Filter water with your Sawyer Mini Water Filtration System. Practice your compass reading skills until you’re confident you could perform them under difficult emergency circumstances. If you assemble all of the items on this checklist in one of the bags in the table above (or a similar one), and practice using them. For the best bug out backpack, check out our must-read article to find out more. You’ll be ready to survive and even thrive in almost any emergency situation you’re likely to encounter. But we want to hear from you. So what do you keep in your bug out bag? Have you ever had to use it? We want to know.